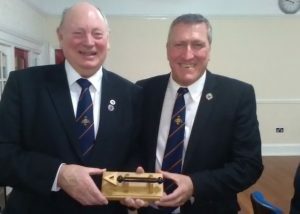 During the Provincial Visit to Backworth RAMs on Tuesday 14th February 2017, a large group of members from Northumberland & Berwick Royal Ark Mariners TI lead by W Commander David Moffett swooped in to claim the Travelling Sceptre. This was presented to the W Commander by the Deputy Provincial Grand Master, W Bro. Stuart Cairns RAMGR. W Bro. Ken Tulip RAMGR who delivered a superb degree at very short notice, looked on. In the second photograph is the W Commander David Moffett with W Bro. 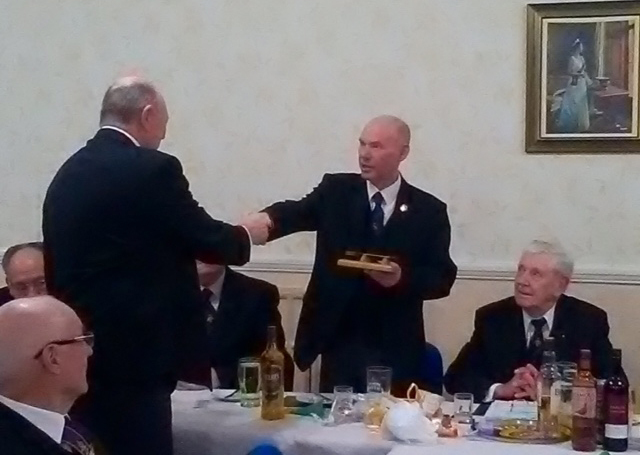 Les Francis Provincial Grand DC with the Travelling Sceptre.